The Colorado Rockies concluded a four-game series with the San Francisco Giants on Sunday. After losing three straight to their division rivals and eight consecutive games overall, Colorado won its first game in over a week. Led by starting pitcher German Marquez, the Rockies defeated the Giants, 4-0, in dominant fashion. Marquez took a no-hitter into the eighth inning and faced just one more than the minimum in the process. Ahead are takeaways from the potential slump-busting victory. Through 16 games, the Rockies have still not managed to score a run in the first or second inning. 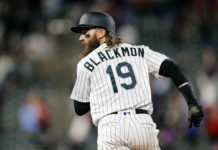 On Sunday, Nolan Arenado managed to reach first base with a walk in the first, but Charlie Blackmon’s groundout to the pitcher and Trevor Story’s strikeout to end the inning were emblematic of the struggles Colorado has had all year. Then in the second inning, Colorado’s early inning woes continued. 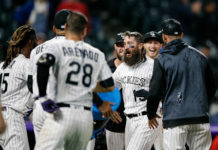 The Rockies saw both Pat Valaika and Mark Reynolds reach base with a pair of walks, but a strikeout, sacrifice bunt and flyout left both runners stranded. The Rockies did not actually record a hit in the game until the third inning – an RBI double from Trevor Story (10). Despite not recording a hit until the third inning, the Rockies hitters generally took better at-bats. By not pressing the issue, the Rockies were able to have four players reach base on balls in the first two innings alone. Had the club been able to take advantage of all their walks, the game could have been broken open early, especially with how well Marquez was pitching. Eventually, that patient approach paid off in the fifth inning. Arenado was able to follow up back-to-back singles with a three-run home run (1) – his first of the season. The left field shot provided Marquez with a healthy lead – and as a result, he was able to confidently go about his business. 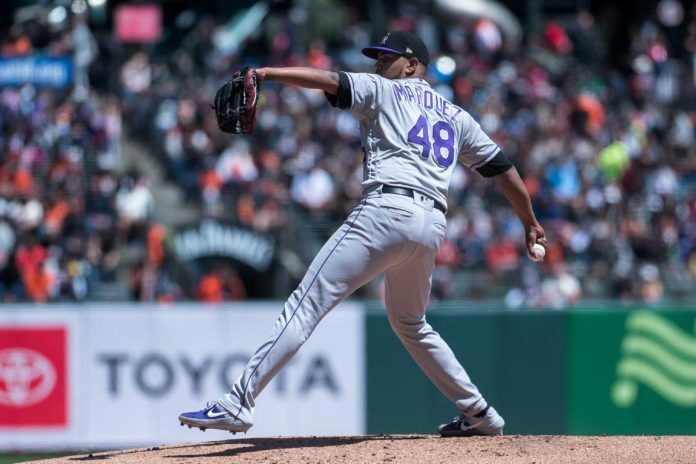 Coming off of a difficult outing against the Braves, Marquez was brilliant for the Rockies in his fourth start of 2019. The young starter retired the first 15 batters he faced and constantly made the Giants look uncomfortable. One of the biggest reasons Marquez was able to breeze through the lineup was his ability to both locate pitches on the edges of the plate and mix speeds throughout his sequences. On one pitch, Marquez would lock up a Giants hitter with an inside changeup – and on the next, Marquez would send him back to the dugout with a perfectly placed fastball. In total, Marquez finished with nine strikeouts and allowed only one hit in a complete game. If the Rockies are going to turn things around in the coming weeks, getting more quality starts from Marquez will be crucial in the future. Following the victory over the Giants (7-10), the Rockies (4-12) will return to action against the Padres (11-5) on Monday. First pitch is scheduled for 8:10 p.m. MT at Petco Park.